Do you love sending email? Do you adore spending time writing out very similar messages time and time again? No, neither do we. 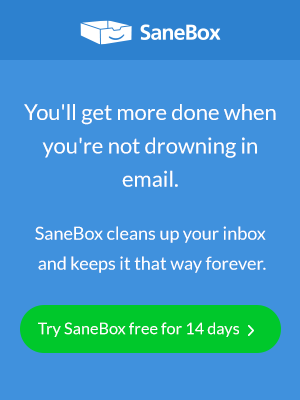 Here at SaneBox, we’re all about making email more efficient and effective. Together with our friends over at Reply.io, we believe there’s one big change you can make right now that will save you tons of time, effort, and finger-fatigue — business email templates. Here’s the SaneBox Scoop on how to set up and use email templates to create and reply to messages quickly and with minimum fuss. Put simply, an email template is a “form email” that you can send out as a new email, or reply with if an email needs a “canned” response. A template is essentially just a collection of words that you’ve refined so it meets the needs of you as the sender and the person you’re sending the email to. Most email templates have areas that you can change depending on the recipient so you can personalize a template. Needless to say, not having to repeatedly type out the same email is a huge time and productivity saver. If you’re going to make the most of your email templates, you need to log the types of emails you send and receive. Monitor all the emails you create or reply to over a month — drag them all into a folder so you can go through and review them. You only need to monitor emails you believe could be optimized with a template, don’t worry if an email is genuinely unique or a one-off. Once you’ve collected your emails, go through them and identify common themes, trends, wording, and messages. You’re looking for the most commonly repeated emails you send. You’ll quickly get a pretty good idea of the types of emails that are ideal candidates for templates. If you don’t, it might just be your emails are highly-specialized, but we’re willing to bet that most people will find three or four good examples for template emails. Now you’ve identified the main culprits, it’s time to setup your email templates. To start with, you’ll need to know how to do it in your email client. Here are some handy links that tell you how to do this. iPhone and iPad — create an email template using the Notes app (video). Gmail — setting up and using Gmail templates. Outlook — creating and using email templates in Microsoft Outlook. Apple Mail — creating reusable email templates in Apple Mail. If your email client isn’t listed above, just Google “[email client name] email templates” for information on how to set them up. Once you know how to create and use templates, you can put the messages together for your templates. Here are some hints on how to do that. Look through the emails you’ve already sent and find the best wording from each. Combine that wording together to create an email that reads well. Remove any extraneous text — brevity is the heart of a good email. Include space to personalize the email as necessary — that might be with the person’s name, job function, what you need them to do, the names of attachments, or anything else that’s relevant. Put yourself in the shoes of the person receiving the email — does it tell them everything they need to know? Does it share information in the right way? Does the email read well? Copyedit, proofread and refine the template. Now you just need to start using your templates and see how they do. Once you’ve started sending and replying with your business email templates, track how they’re doing. Have you had any feedback? Are people still responding in the same way? Are your responses any better or worse? Use your insight to tweak and refine your business email templates until they’re perfect. Here are some popular areas where you might want an email send or reply template. Setting up appointments and meetings. Sending out meeting agendas and minutes. Requesting feedback or sign off of documents or work. Sending our information including reports and other standard documents. Letting job applicants know about their success or failure. Asking your team to complete routine tasks. Turning down requests for work. Saying yes to requests for work. Fast Company’s guide to creating great email templates.